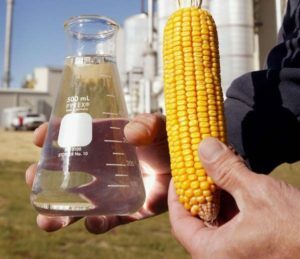 Corn-based ethanol is the renewable fuel environmentalists love to hate. But as turmoil in the Middle East and North Africa has sent oil prices soaring, U.S.-made ethanol is making a comeback. Plants mothballed during the economic downturn are reopening. Domestic ethanol production hit record levels last year, topping 13.2 billion gallons, according to the Renewable Fuels Association in Washington. Oil companies that snapped up facilities when the industry hit a rough patch a few years ago – including Valero Energy Corp., Sunoco Inc. and Marathon Oil Corp. – are looking to expand. In Stockton, Calif., a once-shuttered factory is now thundering to life. Train cars laden with Midwestern corn arrive daily to feed the grinding mills and steaming pipes that distill the grain into the gasoline substitute. The surrounding air is pungent with the smell of yeast. For the plant’s owner, Pacific Ethanol Inc., which weathered bankruptcy and is slowly reviving three of its plants, it’s a whiff of vindication. “Ethanol is an important part of the country’s energy picture these days,” said Neil Koehler, chief executive of the Sacramento, Calif., firm. That’s largely because of Uncle Sam. Concerned about U.S. reliance on foreign oil, federal lawmakers mandated that the nation quadruple its use of biofuels from 2008 levels, to 36 billion gallons annually by 2022. Corn-based ethanol is assured a 15 billion-gallon share of that market. Plus, it’s heavily subsidized. The federal government gives producers a tax credit of 45 cents a gallon. A number of states provide subsidies as well. The liquid is blended into almost every gallon of unleaded gasoline sold in the U.S and accounts for about 10 percent of the fuel that motorists pump into their cars. That percentage is set to rise; the U.S. Environmental Protection Agency recently approved the use of blends of up to 15 percent ethanol for newer vehicles. That’s good news for the ethanol industry with oil now topping $100 a barrel and motorists experiencing sticker shock at the pump. But whether corn ethanol is good for the planet, U.S. taxpayers, the global food supply – or even an automobile’s engine – is a matter of intense debate. Some scientists have concluded that growing corn, harvesting and distilling it, and trucking it to refineries causes as much environmental damage as burning oil. Many environmentalists want taxpayer subsidies devoted to developing next-generation biofuels – rather than supporting huge agribusinesses and the oil companies now operating ethanol plants. Budget hawks also want to end ethanol subsidies, with the U.S. budget deficit is ballooning. About 35 percent of the U.S. corn crop will be devoted to ethanol this year, a figure that makes some agricultural and global food policy analysts uneasy.